Growing up, our family was on the move quite a bit. I was born in Nebraska, spent my middle school years in Tennessee, and consider Wisconsin where I truly grew up. I was introduced to church at a young age, and I put my faith in Jesus while living in Tennessee. I was a youth group kid growing up, but it was in late high school and early college when my faith became an integral part of my life. It was when a group of high school buddies decided to all dive in together and pursue who God was calling us to be that my relationship with Jesus deepened. I attended University of Wisconsin-Milwaukee to pursue a Graphic Design degree, but while there dove into campus ministry, facilitating mission trips for high school students, and eventually worked as a ministry intern at the church I attended all through college. After finishing my undergraduate degree, I moved to Minneapolis to begin classes at Bethel Seminary. It was during college that I felt God aligning my passions and talents for ministry within the church. I want to see people know Jesus and be known when they walk into a place like Eagle Brook. I have lived in Northeast Minneapolis for the past seven years—six of those on staff at Eagle Brook. 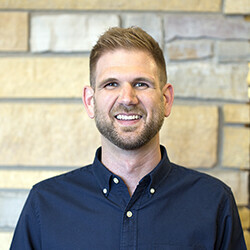 I have had the chance to launch Student Ministries at the Woodbury campus, work alongside and lead the ministry pastors at the Blaine campus, and now lead the Lino Lakes campus. I am a cyclist and runner, beginning triathlete, occasional backpacker, and a Packers fan. I am known around the office and in my group of friends as a coffee nerd or snob, but however you hear it just know—I love coffee.